Scots who have experience working in the licensed trade but have fallen on hard times are being encouraged to apply for one-off grants as part of an industry charity’s ‘Glass Half Full’ campaign. Over the years the Scottish Licensed Trade Benevolent Society, known as The BEN, has helped a host of beneficiaries from throughout Scotland with one-off grants of up to £1,000 for everything from essential monthly payments including rent, phone and fuel bills to one-off payments for redecoration, clothing and even funding towards a lost wallet. The charity has been providing social, financial and emotional support to members, both current and former, of the licensed trade for over 150 years including regular discretionary payments as well as one-off grants. Over 50% of one-off grants since 2011 were for redecoration or household appliances including new cookers, fridge freezers and vinyl flooring while 19% were for essential bills including mortgage payments, rent, heating, insurance and council tax, highlighting the importance of the service. During this time, grants were also provided for a new boiler, numerous household repairs as well as healthcare and travel support. 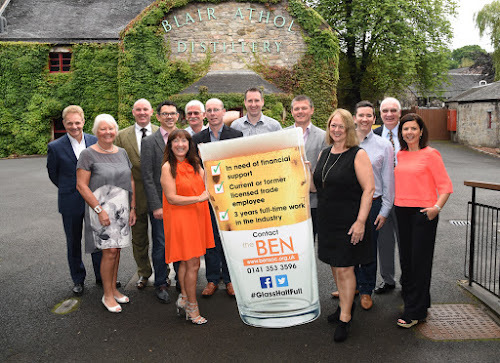 As well as encouraging potential beneficiaries to get in touch, the Glass Half Full campaign aims to engage members of the licensed trade, and general public, to help spread the word and Chris Gardner, chief executive of The BEN, hopes it will enable the charity to support more people throughout Scotland than ever before. Support is also provided through The BEN Pitlochry Estate, which consists of 18 bungalows, and offers accommodation for current and retired members of the licensed trade industry as well as ‘Respitality’ breaks for carers in some of the most picturesque surroundings.